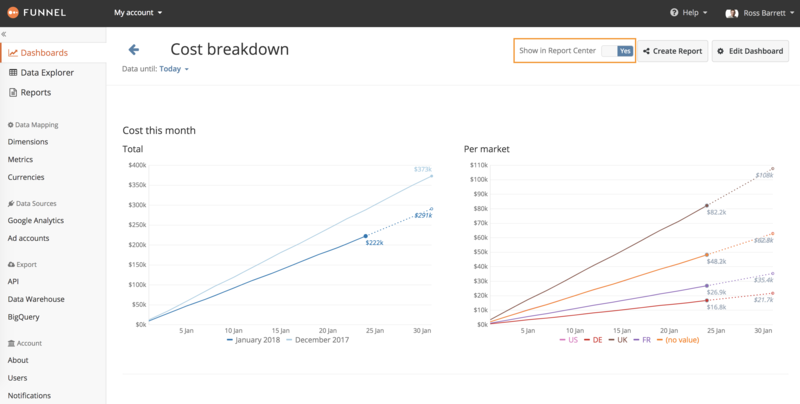 What is the Report Center? Having sent a few reports to your client, manager or other stakeholders it easily becomes hard for them to keep track of them all. 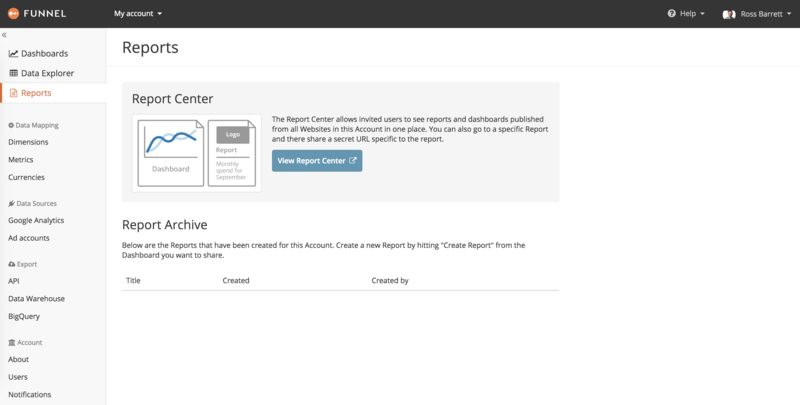 The Report Center gathers all reports created in a Funnel Account so they’re accessible in one place. You can also share dashboards, which means you can give your clients or other stakeholders a way of always being up to date on the most important metrics in a white labeled view. The Report Center has three tabs where you can view your reports and dashboards, edit the layout, and invite Report Center users. View: Review the Report Center, this is what the Report Center will look like for invited Report Users. Edit layout: Change the layout of your Report Center to make it look like your brand. Add your logo, change the welcome text and the "Brought to you by Funnel" text. Manage Users: Invite clients, co-workers or other stakeholders that you want to have access to the Report Center. It is important to note that any existing users in your account will already have access to your Report Center and adding them on this page will revoke their account access. All of the reports you create will be accessible from the Report Center automatically. If you wish to display live dashboards in the Report Center all you need to do is select Show in Report Center in your dashboard. To remove a Report from the Report Center, just navigate to the Reports section. Here you will see a list with all created reports. Click Remove and the report will be deleted from the Report Center.